Anyway, aside from my daunting birthday vastly approaching, i start my first day at Costa Coffee tomorrow. I got this job JUST to run my car, so that my student loan can go on clothes and shoes... blah blah think what you like but my car is an absolute buggar to run! If you are aware of insurance prices then you more than understand what i'm blabing on about. Also, growing my hair out is taking forever! I have an inch of roots and and i'm aiming to completely grow out my hair to its natural colour. (Unif model aspiration much?) I'm also growing my eyebrows out... as in... not plucking? Yes, a very daring idea but i'm kind if digging it, its looks fit, i like it. I'm not going for a 'Lilly Collin's' look in particular because it just wouldn't suit my eye area (which is annoyingly small) but i'm most definitely going to grow them naturally out, but neaten them up a bit. I'm trying to get my hands on an iphone 4s, the cameras awesome and i need one else i'm pretty sure i'll have a break down. Trading in shoe's i don't wear, my blackberry... I'm putting together a plan because iphone4s is definitely a must have for anyone right now and i want to post pictures of myself on the go... shopping.. etc etc.. I can't afford a flashy camera and my boyfriend has the 4s and the camera ACTUALLY has the ability to make me look pretty decent. 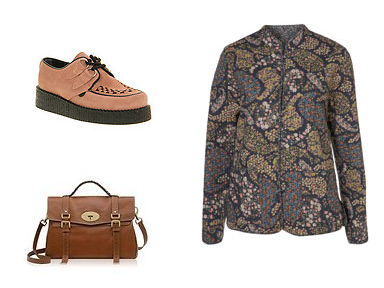 iPhone 4s, Mulberry Alexa, Paisley jacket and Creepers, i'm coming to get you!